Do you currently have a Loyalty Programme in place and would like to know where your Programme stands from a Best Practice viewpoint? Consider a Loyality Check by global experts – www.loyalitycheck.com - who will do a thorough and candid examination of your business strategy, operations, competitive gaps, data analytics, customer engagement, communications, technology, operations and financial liability and provide specific recommendations for fine-tuning or overhauling your Programme. The Customer Strategy Network (CSN) has launched a new evaluation service called 'Loyality Check' to help brands that are operating loyalty and rewards programmes to demonstrate both the effectiveness and profitability of their initiatives. The service provides an unbiased assessment of every aspect of programme operations and provides measurement, insights, and recommendations to help improve performance. According to Mike Atkin, founding partner for the CSN, "Data-driven loyalty programmes continue to be a priority in the marketing mix worldwide, and the pressure to prove bottom line results has never been greater". Consequently, Loyality Check offers a full and frank investigation and measurement of all programme elements, identifies gaps, competitors, best practices, and recommendations for practical performance improvements. Its scope includes business strategy, data analytics, customer engagement, communications, technology, operations and financial liability. According to CSN co-founder Bill Hanifin, "Most loyalty programmes need a 'reality check' as customers aren't engaged enough, and financial returns could be improved." 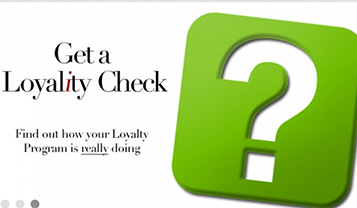 Loyality Check are part of the Customer Strategy Network. Premium Group represents the Customer Strategy Network in Australasia.